Jaguar has already shocked us with two-tone black gloss D-pillars on the XJ and, more recently, on the new XF Sportbrake estate (as correctly predicted by CAR). But how about an XJ with Mini-alike black gloss applied liberally elsewhere? Our man with the long lens who lives in the bushes around Jag's Coventry engineering base recently got more than he bargained for when he spotted this XJ prototype. It's a metallic grey regular-wheelbase XJ, but with black gloss front bumper assembly and rear valance. It looks kinda shocking for a Jaguar – a bit like Ian Callum's design underlings have gone crazy with the black gloss spray gun. So Jag will soon start selling two-tone XJs? Hold your horses! This is presumably a prototype lash-up, our sources suggest. There are no plans to offer a factory-approved accessories kit with more bling gloss scattered around the bodywork. Perhaps it's an option that could be explored by tuners such as Kahn and Mansoury. Or perhaps Merc can help out with a Jaguar XJ Black Series. 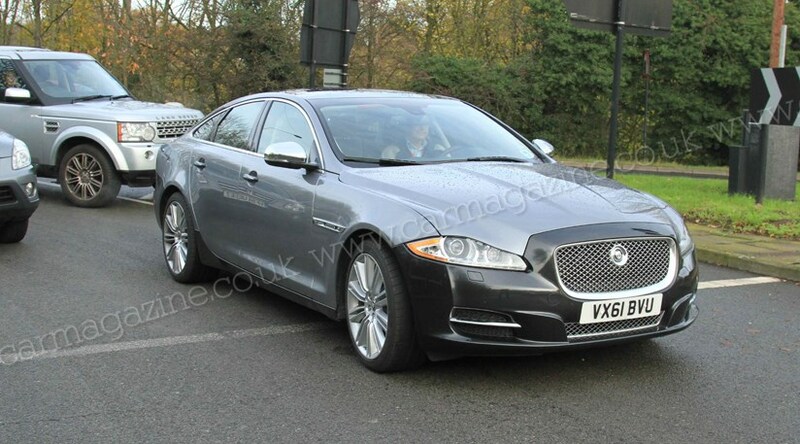 So what is this Jaguar XJ doing on test? Jaguar is busy readying four-wheel systems for its saloons – we'll see the 4wd XJ and XF imminently. But we hear also that Jaguar may be using XJ limos to test the new V6 powertrain destined for its new sports car heralded by the C-X16 coupe. The company sells a 3.0-litre V6 petrol engine for export markets such as China but doesn't sell the car in the UK. This two-tone XJ is powered by the V6 engine – so it could be a testbed for future derivatives of the bent six, bound for sportier looking cars than this four-door exec. Sadly, it's a far more mundane answer than a blackened, two-tone Jag XJ. Shame.